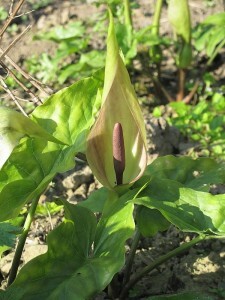 Most woodland plants flower in early spring before the woodland floor is shaded by the leaves on the trees (otherwise known as the canopy). Therefore I expected to see some flowers in bloom during my visit to Hollington on April 1st. I wasn’t disappointed. 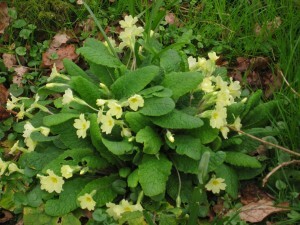 Clusters of dainty yellow primroses were in full bloom, particularly striking along the banks of the stream. Bluebell leaves were almost everywhere and quite advanced on the north east bank. Some in this area measured up to 13 inches already (yes, we were sad enough to measure them). Surprisingly, we spotted one lone bluebell already in flower, a strange phenomena as the others around it weren’t even close to flowering. 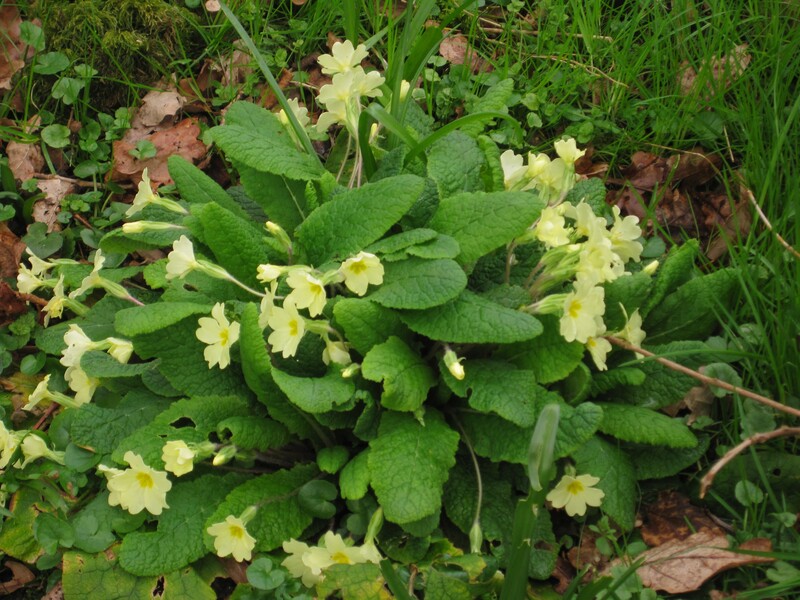 The shade from the closed tree canopy prevents more competitive, non woodland plants becoming dominant and ultimately suppressing plants such as our beloved primroses and bluebells. Although most woodland plants can survive long periods of dense shade, they won’t actually flower; therefore if a wood isn’t regularly coppiced it will eventually lose those lovely colourful carpets of bluebells. Coppicing, put simply, involves cutting small areas of trees periodically and allowing new growth from the stumps (if the ever increasing deer populations don’t eat the tasty new shoots!). Coppicing allows light to reach the woodland floor and plays a crucial role in maintaining a healthy, diverse mosaic of habitats. Interestingly, research has shown that some woodland flowers reach a flowering peak after the 2nd and 3rd year of coppice. Philip and John have been really busy coppicing so hopefully we’ll see some particularly good flowering displays in the coppiced areas over the next few years. 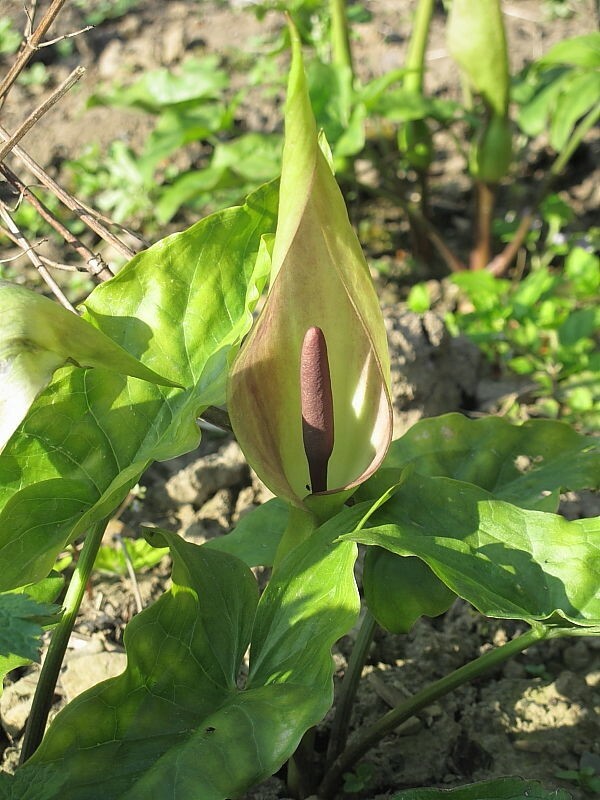 Other plants just showing their leaves in the wildflower (or field) layer, indicative of ancient woodland were early purple orchid (in the coppiced areas) and lords & ladies, also known as cuckoopint. Often the leaves of lords & ladies have black spots, these are said to be the spots of Christ’s blood as they grew under the cross. 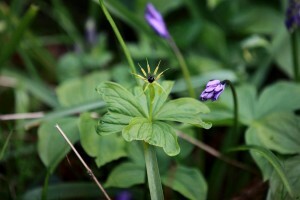 As I completed my visit, I remembered to ask Philip if there were any herb-Paris in Hollington. 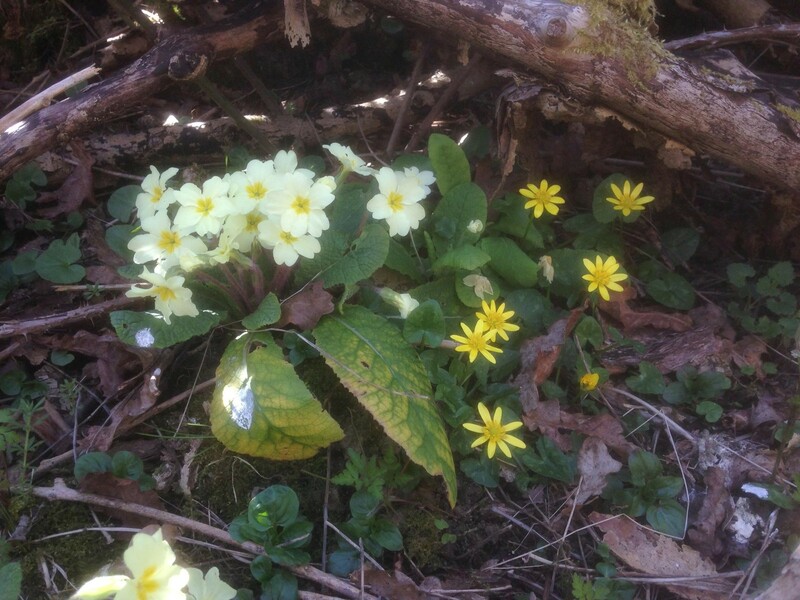 Philip told me it was one of his favourite woodland plants but we’d missed the opportunity to see them as they grow deeper in the wood. We’d have to look another day as the light was fading. Due to its symmetry, herb-Paris was known in folklore as the plant of harmony and often associated with weddings. It was also apparently used as protection from witches (amazing the ‘off track’ information you fall across when researching!). It prefers shade, in undisturbed, damp woodland so it will actually decline from areas of recent coppice unlike the bluebells or primroses. These different habitat preferences of just a few plants are examples of the importance of maintaining a mosaic of different habitats (I know, I know. I’m repeating myself but it really is important for biodiversity). Violets were also in bloom during my visit. I’m not 100% certain but I think due to the heart shaped leaves these are common dog violets. Although the word viola is the Latin often used for sweet smelling flowers, the word ‘dog’ indicates this is one of the species that has no scent – therefore only good for dogs!? 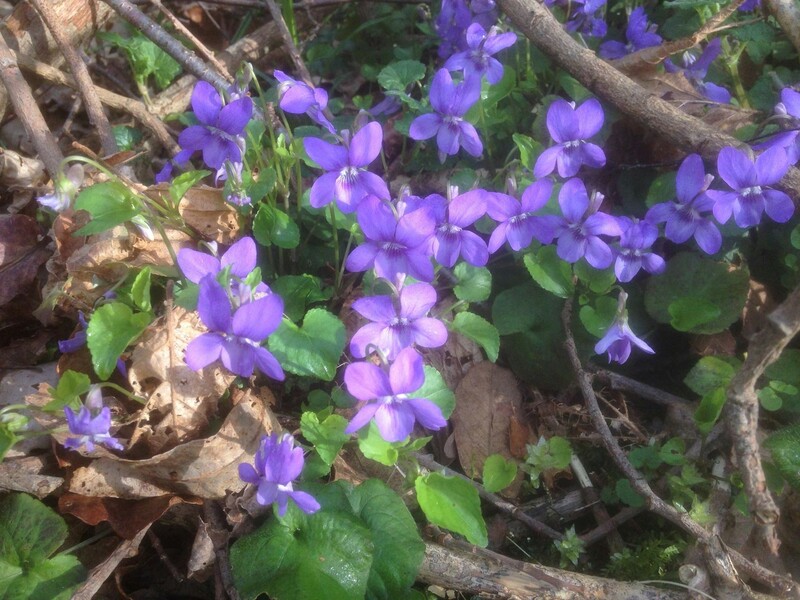 However, research has shown that wild violets are very important as an early source of pollen and nectar for bees and also to butterflies, including larval food for some species of fritillaries. As I’ve mentioned, many woodland flowers are important for early pollinators such as bees, moths and butterflies. 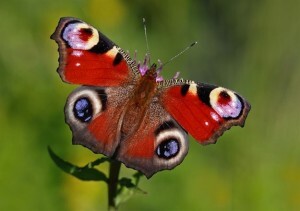 Butterflies are known as a great indicator of biodiversity and UK woodland support two thirds of our butterfly species. My visit on the 1st of April was a rather dull cool day so not much obvious butterfly activity. 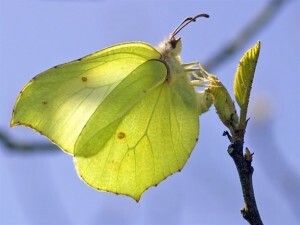 However, a few weeks earlier, on a warm day in mid March, I saw brimstone and peacock butterflies along the rides (the rides have open canopy and therefore warmer). These are just two of our butterfly species that overwinter, often in hollow trees, and were probably searching for energy giving nectar from the early flowering plants. Unfortunately many of our woodland butterflies are listed as a conservation concern and neglected or mismanaged woodland contributes to their declining numbers. Thankfully Hollington has a great management plan and as the weather improves I’m looking forward to lots more butterfly spotting. Source: Georgina Sanders (Sanders & Jones, Olney). 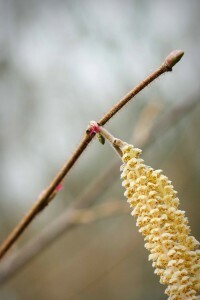 Clusters of male catkins were on the hazel trees during my visit. Hazel pollen is not sticky so bees find it difficult to collect; also it doesn’t provide nectar (butterflies mostly feed on nectar). Instead it relies on the wind for pollination. It’s one of the reasons the catkins are out before the leaves, it gives the pollen a better chance of spreading in the wind. When flicked, the catkins showed no pollen dust so I guess the wind has done its job, particularly as we’ve had some pretty blustery weather recently. Hazel is monoecious which means both the male and female flowers are on the same tree. The tiny red female flowers near the (male) catkins are beautiful and so petite I didn’t spot them until Philip pointed them out. We noticed the hawthorns were budding at the same time as the hazel this year, which is unusual as hawthorn is typically out well before. The weather has been rather cold and dry whereas this time last year it was wet and quite mild. Could that be something to do with the unusual budding time of the hawthorn? I’ll write more about hawthorn in a future blog. Goat willow also grows in Hollington but unlike the hazel, willows use both insects and wind for pollination. 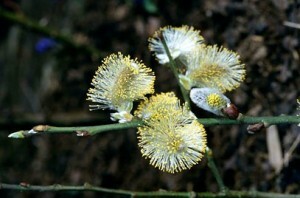 Goat willow is dioecious which means the male and female flowers grow on different trees. It’s a good early food source, particularly for honey bees and some bumblebee queens. The honey bees from the hives in Hollington were particularly busy a few weeks ago when my visit was on a warmer day so no doubt they’ve been making good use of the goat willow. As the honeybee hives are a recent addition to Hollington, out of curiosity I looked into any possible conflict with other pollinators (such as the bumblebee). To date the few papers I found on the subject don’t indicate there is a conflict although they do state further research is required. 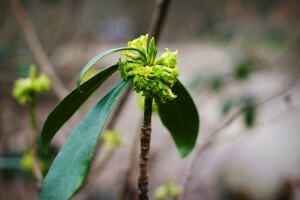 We noticed a few of the evergreen spurge laurels as we ended our walk and Philip mentioned they are the most significant early flower in Hollington (a word of warning: all parts of the spurge laurel are toxic and even just touching it may cause blistering so be cautious if you come across it). 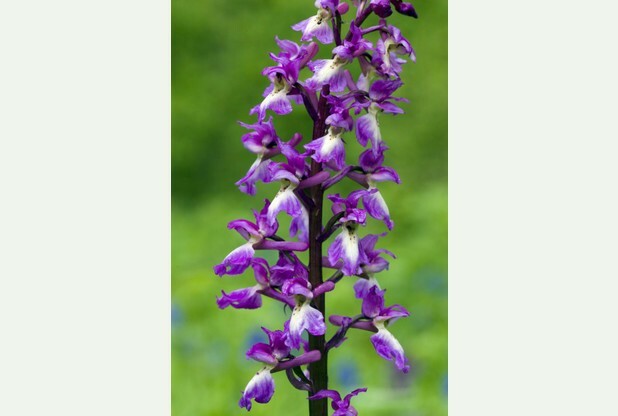 It prefers shady, deciduous woodland and although widespread in England, is usually a localised plant. The small yellow green flowers bloom in late winter / early spring to make the most of the light before the tree canopy closes. The flowers can be highly scented to lure the early pollinators. The scent tends to be stronger in the evenings, peaking at dusk, most probably to attract moths. The UK does have a few active moths during the winter with some species preferring woodland habitat. On a slightly sombre note; there is concern among many conservationists that the warming weather (as a result of climate change) may alter the structure of woodland plant communities. Ancient and native woodlands are vital for the survival of many of our insects, mammals and birds. Research has shown that trees regularly bud earlier in the south of England than they did just 20 or 30 years ago. This could unbalance woodland tree and plant communities. 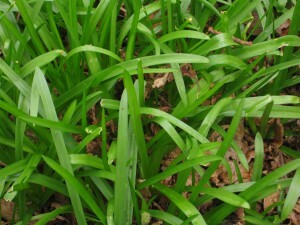 For example, oak trees may bud earlier at the expense of ash, or the cow parsley may grow earlier shading out plants like bluebells and primroses. This of course will affect the entire (and complex) food web. However, these are just projections and no one really knows what changes the warming weather will bring or what adaptations will need to be made. Even so, it’s a reality and therefore important to look at environmental signposts for the future of woodland management and conservation. So much to write about: the stream, the ponds, deadwood, invertebrates, fungus, mammals, birdlife, mosses, lichens, liverworts, chemical exchanges, air quality, wildlife corridors, genetic diversity and much more. When I first contacted Philip to ask the price of his sustainable firewood, we soon discovered our mutual love for nature and recognised we were kindred spirits in recent life and work choices. 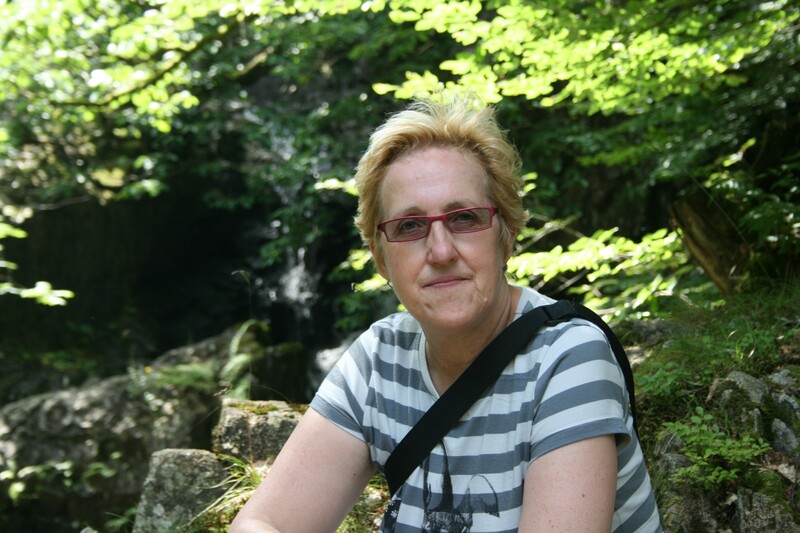 In 2010, tired of years of soulless corporate life, I decided life was too short not to follow my lifelong passion for nature and the environment so I resigned from my post as a director of a company in Milton Keynes. At the age of 50, for the first time, I went to university and took my place on an Environmental Conservation science degree at Nottingham Trent University. I can’t deny it wasn’t without some trepidation that I waved goodbye to my lovely new company car and all the other usual executive perks (or trappings?) to live on a student loan. Feeling positively ancient sitting amongst the 18 – 20 year olds and with endless self doubts about my academic ability, I proudly graduated with a BSc in Environmental Conservation in the summer of 2013. I’m a longstanding volunteer warden for the RSPB wetland conservation site at Otmoor near Oxford and have attended RSPB residential volunteer weeks in the Lake District. For the past 5 years I’ve also contributed to bird and butterfly surveys for the British Trust for Ornithology and the Butterfly Conservation Trust. I’d like to share some of my passion for conservation & ecology and discuss the seasonal / weekly changes in Hollington and the adjoining wider countryside. I’m not a great photographer but will take some snapshots to share. Others I’ll simply ‘borrow’ or suggest useful websites. What I lack in eloquence I hope to make up for with my love of nature. I am quite passionate about the importance of protecting our ecosystems and the services it provides (clean air, water and food; not to mention the spiritual element of being close to nature) so will try to be succinct.